Whether trimming or cutting metals, wood, plastics, and composites, ABCO Automation can design and build a robotic routering system that quickly and efficiently removes material from a surface or edge. We program robots to either cut through the material’s surface, remove a section of material, or trim material to a specified measurement. As part of our design process, we assess the best technique for material removal albeit the robot holding a high-speed routing spindle with a cutting/trimming tool (bit) and presenting the tool to the part or the robot retaining a fixture via clamps or vacuum cups and presenting the part to the tool. When the robot holds the product via a fixture, it can perform additional functions, such as loading, dispensing, polishing, and palletizing, before or after the routering process. This approach lets manufacturers maximize the robot’s capabilities and availability, which helps companies achieve a quicker return on investment. In addition, robotic routering enables manufacturers to virtually eliminate set up times, making running small jobs feasible and attaining a high Overall Equipment Effectiveness (OEE) percentage. ABCO aims to design and build routering systems that realize a 100 percent OEE score, which supports manufacturers to produce good parts as fast as possible with no stop time. ABCO’s Controls Software integrates with Manufacturing Execution Systems (MES). This combination is ideal for any organization looking to have real-time visibility of work-in-progress on the manufacturing floor or production processes with many variants and numerous transactions. To help run a range of jobs with mixed specifications, our software includes pre-programmed algorithms. These calculated set of instructions enable operators to alter one parameter, such as width, and auxiliary parameters (length or height) change automatically by internal logic arguments versus making manual adjustments. With the ability to immediately change a job on the spot, even if there is only one piece, manufacturers gain increased productivity. ABCO’s routering system supports manufacturers choosing to implement a single-piece flow production system. As part of ABCO’s routering system, a separate tool stand with various spindles and bits allows the robot to select a tool, route to the shape or depth, replace the tool, then pick another tool for an additional routing process. A single-piece flow system lets manufacturers process one part/product at a time versus batch processing. With this lean manufacturing system, manufacturers detect defects immediately forcing real-time corrective actions, gain scalability to accommodate shifting customer needs, and improve productivity by eliminating redundancies and downtime—which, in the end, translates into higher operational efficiencies. As part of an ABCO routering system, we can include a 100 percent inspection system that ensures every part/product is inspected to determine specifications and quality compliance. For those applications that require checks on thickness, width, and length, we integrate laser sensors to calculate measurements and transfer the data to the control system for comparison against pre-determined parameters. With the addition of a vision system, product can be inspected for proper routed depths as well as tooling to verify that the tool is maintaining the correct depth or to check for missing or broken tooling. Collected data is relayed to the control system for validation against specifications. Both inspection systems provide quality checks that are key to reducing any downstream waste. Cutting metal, wood, fiberglass, plastics, or composites can create a hazardous environment for workers. Exposure to flying chips or material, excessive noise levels or vibrations can lead to immediate or chronic health hazards. According to the Occupational Safety and Health Administration (OSHA), exposure to wood dust has been associated with a variety of adverse health effects, including dermatitis, asthma, and cancer. By removing employees from such environmental elements and replacing workers with a robot greatly reduces the potential for employee health issues—manufacturers will appreciate that robots don’t take sick time. 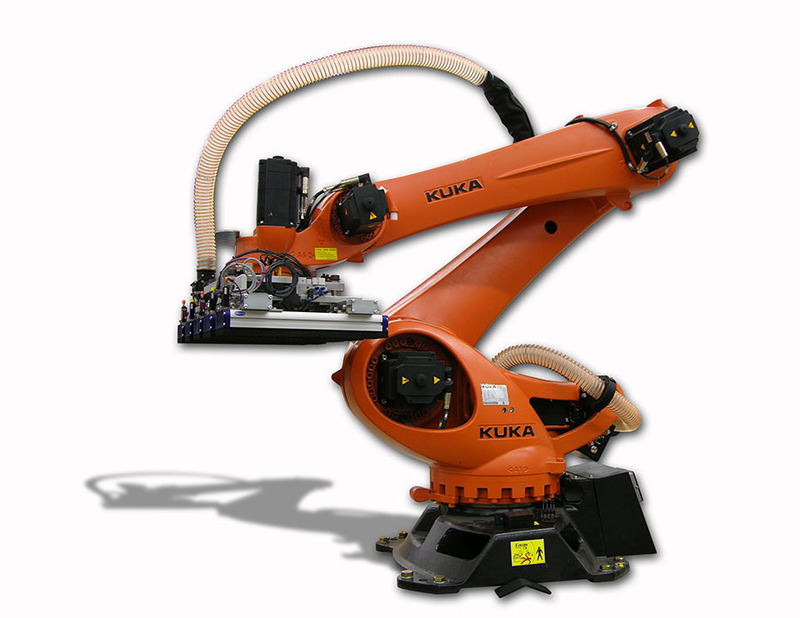 Our extensive experience working with a variety of robot manufacturers, including KUKA, Fanuc, ABB, and Yaskawa, gives us insight about robot nuances and allows ABCO engineers to specify the precise robot for the job. Combined with our expertise in material removal, we can create a system that balances all the important variables, including path accuracy, product variances, and process variability. An ABCO robotic routering cell is comprehensive, including robots, end-of-arm tooling, control system, infeed/transfer/outfeed conveyors, vision inspection, safety fencing, and dust collection.